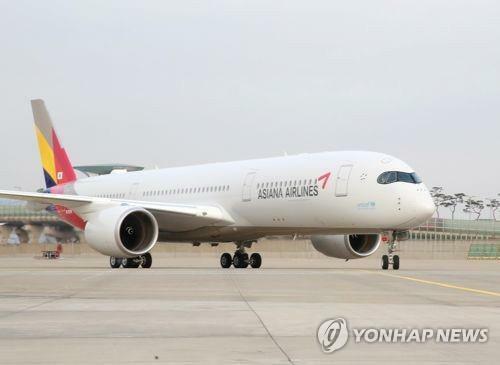 SEOUL, Feb. 14 (Yonhap) -- Asiana Airlines Inc., South Korea's second-largest airline by sales, said Thursday it posted a net loss last year due to currency-related losses. Operating income fell 35.3 percent on-year to reach 178 billion won, while sales rose 10 percent to a record 6.85 trillion won over the cited period. The company attributed the weakened bottom line to currency-related losses and increased jet fuel costs. Its jet fuel costs swelled by 433 billion won last year compared with a year earlier, it said. Its debt ratio stood at 504.9 percent at the end of last year, down 83 percentage points from a year ago, helped by 1.09 trillion won in debt repayment and proceeds from asset sales.